Did you ever wonder how long it takes to deliver a speech? Or how much time you need to read a book? 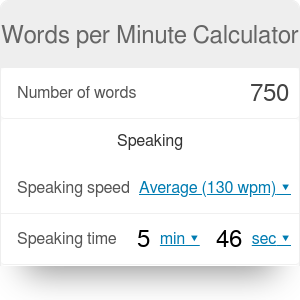 This words per minute calculator (or WPM calculator for short) will help you convert between the number of words and time. This way, not only will you know how many words is a 5 minute speech, but also how long it takes you to read a document with 2000 words. If you wonder how much time you need to finish a book, head straight to our reading speed calculator! In order to determine how long your presentation takes, you first need to figure out your speaking speed - how many words per minute of speech you can deliver. For example, the average speaking speed in English is 130 wpm (words per minute). If, however, you are frequently told that you speak very slow or very fast, you should adjust this value accordingly. Another thing you could do is measure your speaking speed. Set a timer to one minute and start reading a text out loud. Once the timer rings, count the words you managed to read. This number is your words per minute speech speed - you can input it directly into our calculator after opening the advanced mode. The same principle goes for your reading speed - the number of words per minute of reading. The average reading speed for the English language is between 170 and 240 wpm, depending on the text difficulty and your natural aptitude. Once you know your speaking and reading speed, the calculations are a piece of cake! All you have to do it input the number of words in your speech into this words per minute calculator, and it will tell you how much time your presentation takes. Of course, you can also use this calculator to figure out the maximum number of words in a speech with a limited time frame - for example, 5 minutes. Let's look at the calculations in more detail. Choose whether you will be speaking to an audience or silently reading the text. In this case, we are going to choose speech. Select your speaking speed. We will stay with the average value of 130 wpm. Determine the duration of the speech - here, we will pick a 5-minute elevator pitch. Your speech can have a maximum of 650 words. Words per Minute Calculator can be embedded on your website to enrich the content you wrote and make it easier for your visitors to understand your message.